*NOTE* - For INSTANT BOOKING we do not do SAME DAY check out and check in. Please DO NOT BOOK DATES WHERE SOMEONE IS LEAVING OR COMING IN on your dates. 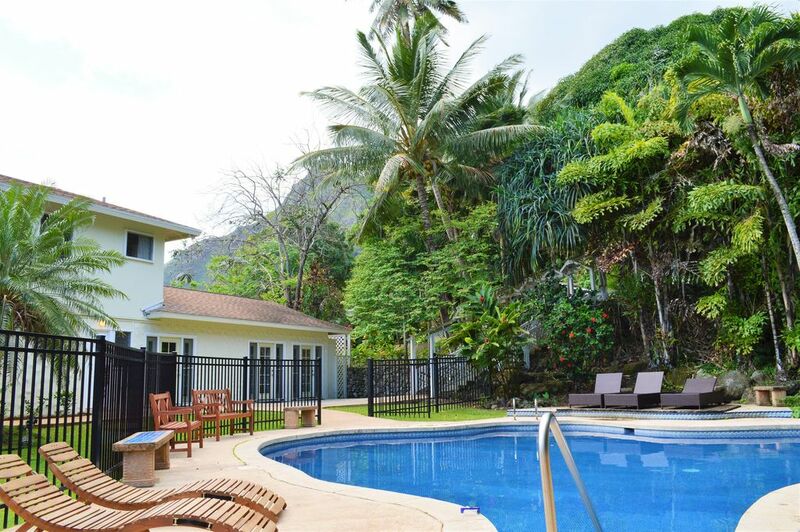 Cool ocean and mountain breezes welcome you to 'The Ko'olau Plantation Estate' your perfect Hawaiian Hideaway. With breathtaking ocean views and 25 feet from edge of property to beach, The Estate is nestled amidst some of Hawaii's most luscious flora on a 5 acre estate. Located at the beginning of Oahu's North Shore, The Estates's seclusion offers you complete privacy yet is still 'city accessible'. 3 separate Hawaiian style homes offering 10 bedrooms, 10 bathrooms, 1 full kitchen and 2 kitchenettes and a Game/TV room, The Ko'olau comfortably sleep 19-22 people. Recently renovated with new furniture in all bedrooms, lounge, dining and lanai areas, the property gives you a true sense of Hawaii country living. Relax and lounge around the gated swimming pool, release that built-up tension on the outside lanai or BBQ Gazebo. With complete seclusion, The Ko'olau Plantation removes you from the hustle and bustle of city life and offers you your own 'natural spa'. Perfect as a Company retreat or as a location for any other momentous occasion, The Estates large 1/2 acre front lawn area is ideal to host such festivities. Located just miles from the world famous Polynesian Cultural Center; Hawaii's #1 tourist attraction and Kualoa Ranch Park; site to such movies as Jurassic Park, Windtalkers and George of the Jungle, The Estate offers you all the amenities and comfort of home with all the excitement of a dream Hawaiian vacation. Travel along the North Shore to some of the finest beaches in the world that feature world famous surfing competitions, or simply lock the gates and enjoy your own private seclusion. Snorkel or swim at nearby Kahana Bay just minutes from your rental and enjoy the feel of Hawaiian ocean waters. Nearby attractions include Kualoa Ranch; featuring ATV, 4 wheel and horseback rides, Turtle Bay Resort and Spa, Polynesian Cultural Center Hawaii's #1 attraction and the world famous North Shore beaches. Come away and turn yourself over to the 'The Ko'olau' Plantation Estate...a place where Heaven meets earth. I have been blessed to live on the North Shore of Oahu for the last 30 years. The beauty and simplicity of the country portrays the Hawaii we love and know. As the Property Manager for the Ko'olau Estate, it is my pleasure to meet and interact with such wonderful guests as they join us on our property. The Koolau Estate is located on the North Shore of Oahu which is home to some of the best beaches on the island. It is located in the "country" which truly gives you a taste of the local feel and aspect of Hawaii. The relaxed less rushed pace of the country and its friendly people really gives you a chance to enjoy Hawaii as it should be. Nestled between the mountains and the ocean is truly magical and the Plantation styled homes bring you away from the city feel. You will go away relaxed, invigorated and in love with the Estate and Hawaii! The Estate is located just 30 feet from the beach. (2) Large Café style refrigerator is located in the main house kitchen. Large fridge/freezer is located on Pool house lanai. Deep chest single freezer located in main house. We enjoyed our 7 day stay at "The Plantation" and had plenty of room for the 21 people. Tania was responsive and helpful. We had everything we needed as far as kitchen gear, towels, bedding, etc. It was helpful to have 2 washers and dryers and the extensive frig/freezer space was so helpful, as we ate most of our meals "at home". Having the beaches so close was also a plus! We loved our stay here! My wedding was At the plantation and could not have had A more beautiful setting! The pictures turned out amazing with the mountains behind us and the ocean in front. Tania was very easy to work with and easy to get A hold of if we had questions. Roosters would wake us up every morning but it was so worth it! I would highly recommend this to A big group or A wedding party. We created the best memories! Thank you for sharing your beautiful place with us! Karlee you were so wonderful to have and easy to communicate with. Congratulations again the pictures were amazing! Great scenic views from our resort , which includes that beautiful blue ocean and the nice mountain behind us:) Plenty of dining room with our party of 22 people thru out the week.All our excursions thru the week were not bad as far as getting to each destination. The views from this property are magnificent. The mountain view and the ocean serenity are so healing. Our family couldn't have asked for a better place to reconnect with each other. Its definitely a simple property but we wouldn't have stayed anywhere else. Ample space, luscious tropical surroundings, large lanai with endless tables and chairs for breakfast, lunch and dinner, huge kitchen stove and griddle for family meals, outside bbq, 3 houses for family to spread out, large front grass area for kids to play, game room with tv, chickens, roosters, gecko's....what else can you ask for!! Tania is amazing. Planned with us prior to arrival, checked us in and went over things to do then followed up on us daily. Sitting out on that front lanai and watching the sun rise is unparalleled. Paradise! diving, swam with the sharks, went deep sea fishing, golfing, and went to a luau. But have no illusions about this house. It is a grand old estate with mostly ceiling fans and hardly any air conditioning. The bedrooms are small and the beds only fair. But we made it work. We played cards, everybody worked on 1000 piece puzzle together and had lots of great conversation and they had a big commercial stove with a fabulous grill so we had a great time making a variety of breakfasts and if you are pretty self sufficient like we are, this is the place for you. One of the best vacations we have ever had. Located just miles from the world famous Polynesian Cultural Center; Hawaii's #1 tourist attraction and Kualoa Ranch Park; site to such movies as Jurassic Park, Windtalkers and George of the Jungle, The Plantation offers you all the amenities and comfort of home with all the excitement of a dream Hawaiian vacation. Travel along the North Shore to some of the finest beaches in the world that feature world famous surfing competitions, or simply lock the gates and enjoy your own private seclusion. Venture out to Kahana Bay just minutes from your rental and enjoy the feel of Hawaiian ocean waters. Nearby attractions include Kualoa Ranch; featuring ATV, 4 wheel and horseback rides, Turtle Bay Resort and Spa, Polynesian Cultural Center Hawaii's #1 attraction and the world famous North Shore beaches. Come away and turn yourself over to the 'The Plantation' Estate...a place where Heaven meets earth. * A contract will be sent by the Koolau Estate upon booking outlining the rules and regulations of the property * For all cancellations, there is an automatic $350.00 cancellation processing fee by the Koolau Estate. This fee is OUTSIDE of any VRBO fees. * There is a 50 guest limit for all events, no amplified sound outside of the stereo ipod system on site and no tent set up. Refundable deposit is contingent on adhering to this regulations. * 3 or 4 night reservations are accepted in between 2 close bookings.